THE OFFICE OF Public Works (OPW) spent a total of €8,398 on red carpets as part of its €17.8m spend on the Papal Visit. 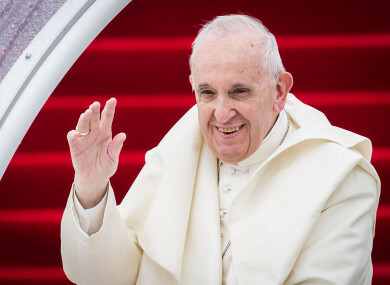 That is according to new figures provided by the OPW’s Freedom of Information unit which provide a detailed breakdown of the OPW’s outlay for the 32 hour visit of Pope Francis last August. The figures show that three different firms supplied red carpets – Mark Rafferty Solutions Ltd was paid €1,248; Martyn Flooring was paid €3,632 and Migira Ltd trading as Trefor was paid €3,518. The detailed breakdown also shows that the OPW paid Prospect Design Ltd €728 for Papal flags while NHC Construction Ltd received €17,277 for the painting of the Papal Cross. The OPW also paid PTD Cleaning Services Ltd €14,949 for graffiti removal services while The Buggyman Ltd was paid €922 for ‘golf buggy hire’. The figures also show that Barendsen received €2,404 for the supply of flowers and Business Mobile was paid €6.396 for the hire of ATM units. The ‘dressing of the media centre’ cost €15,780 with the monies paid to Cube Displays Ltd.
A host of parties were paid for first aid and medical cover; the Irish Red Cross received €35,310; Critical Healthcare Ltd received €66,862 for ‘medical equipment’ and Dublin Civil Defence was paid €97,610 for ‘first aid’. The figures show that St John Ambulance Brigade received €37,788 for medical cover while Tetra Ireland Communications received €25,483 for medical equipment. The cleaning of water tanks cost €3,234 and these fees were paid to T&C Environmental Services Ltd. The big winners in the OPW spend on the visit were Actavo Events Ireland Ltd which was paid €4.92m for ‘temporary site works’; Eamon O’Boyle & Associates was paid €2m for event management services and Eventus Ltd was paid €1.19m for the supply of marquees and toilets. In addition, Pulse Security Management Ltd was paid €1m for ‘security provision’ while Eventsec Ltd was paid €635,346 for security. A host of firms were also paid for providing catering services – Brambles Deli Cafe was paid €45,134; Sodaco Ltd was paid €53,600 and Banqueting Food Systems were paid €76,845. The Phoenix Park overhaul for the visit resulted in CFA Construction Ltd being paid €344,350 for the roadworks and resurfacing in the park with Des Byrne Painting Contractors Ltd receiving €86,356 for the painting works that included the painting of railings. The figures show that PJ Hegarty & Sons was paid €244,025 concerning works done to the gates at Phoenix Park. In total 155 parties have been paid or awaiting payment with the vast majority paid to date. Speaking at the Oireachtas Finance committee this week, Minister for the OPW, Kevin Moran defended the OPW outlay. Email “Red carpets, flags, golf buggies - the €17.8m spent by OPW on Pope visit ”. Feedback on “Red carpets, flags, golf buggies - the €17.8m spent by OPW on Pope visit ”.